Winner of the Grand Jury Documentary prize at the Sundance Film Festival, Syrian filmmaker Fayyad and Danish co-director Johannessen’s breathtaking work – a searing example of boots-on-the-ground reportage – follows the efforts of the internationally recognized White Helmets, an organization comprised of ordinary citizens who are the first to rush towards explosions in the hope of saving lives. Incorporating moments of both heart-pounding suspense and improbable beauty, the documentary draws us into the lives of three of its founders – Khaled, Subhi, and Mahmoud – as they grapple with the chaos around them and struggle with an ever-present dilemma: do they flee with their families or stay and fight for their country. 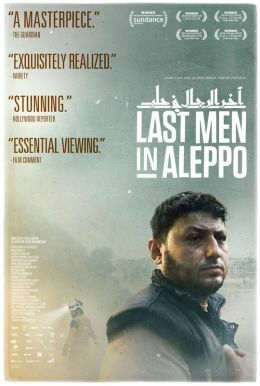 A gripping portrait of extraordinary bravery, Last Men in Aleppo provides a stirring new perspective on a conflict reshaping our world.